God always shows up when we reach out to Him. Imagine going to your parents house for dinner one night. Your mom took great care to make your favorite meal. You walk into your parents house, sit down at the table, eat the delicious dinner and then leave the house without saying a single would to your mom or dad. The meal wouldn’t be as satisfying and you would feel like something was missing— conversation, relationship, acknowledgment of all the work your mom put into preparing and cooking the meal for you. Not only would you feel as though something was amiss, your mom would feel hurt and sad that you came and didn’t even want to talk to her. She had so much to tell you and just wanted to spend time with you, hearing about your dreams and passions. She has so much wisdom that she’s bursting to impart into you. Would you ever do that? Then why do that to God? That’s why talking to God first thing in the morning and before diving into His Word is so important. He’s prepared His Word for you, has wisdom to impart into you and loves spending time with you. The more time spent with God the more we grow to love Him and understand His love for us. God is always faithful when our expectation is in Him. We pray and anticipate His Presence. That’s when we are blessed by believing. As Mark Batterson says in The Circle Maker, “Instead of operating by faith, we switch back to our default setting of logic. Instead of embracing the new move of God, we fall back into the rut of our old routines.” (pg. 69) Prayer opens our heart to receive all God wants us to have and learn. Prayer honors God– the God who gave His only Son to pay for our sins and shame. He deserves our praise and honor. Talking with God ignites our faith, grows our desire to know Him and in return, He opens His Word to us. Take time to pray today— right now. What does your quiet time look like? Do you spend time in prayer daily? Father God, Thank you for pursuing a relationship with me from the very beginning. You have given so much and I desire to honor you with my time and choices. Set my heart on fire, Jesus, rain down on me, speak to me and open up Your scripture to me. I want to be like You, think like You and please You in every part of my life. Have you ever faced your biggest fear head on? I recently came face to face with my biggest fear: losing my children. In December 2016, my husband and I took our two girls to Busch Gardens for Christmastown. It was a magical time filled with holiday lights and music. We went with some friends and were having a great time until we lost Charleigh. It was night time. The park was crowded and we couldn’t find her. One of our friends ran to the front of the park to inform security and head off any potential threat to her safety. In that moment I had a choice to make. I was going to fall apart, cry and think the worst OR I was going to remember God’s promises and trust Him. I chose the latter. Immediately I started praying protection over Charleigh (Psalm 91). I started asking God to send His angels to surround my daughter and hide her from any potential threat (Psalm 34:7, Colossians 3:3). I asked the Holy Spirit to lead me to her and that I would find her safe and sound (John 16:13-14). “WHERE?!?!? WHERE?!? !” I thought. I immedately turned to look and Charleigh was on a kid’s ride right behind me. She was right next to us the entire time we were looking for her. She was safe. She was close. She was in big, big trouble. I was calm in the midst of my biggest fear. The only way I could’ve experienced that peace was through Jesus. I know, that I know, that I know He was holding me, comforting me and guiding me through that trial. But I had to make a choice… I was going to panic or trust. Like David, I chose to trust God in the midst of the unthinkable and allow His Word to produce an unshakable confidence. I wasn’t going to let the worries of this world choke out His promises. In 1 Samuel 17, David confronted his “problem” head on with confidence in the power of God backing him up. When the opportunity arose for him to act, he did. Trust in God is confidence in His power, not ours. David didn’t just say he trusted God’s power to deliver him, he expressed his trust by the way he acted and with specific examples of God’s faithfulness. (1 Samuel 17:34,37) He was able to act out his trust due to the retention of God’s Presence he experienced when He spent time with Him in the pasture. He also didn’t fight his battle with unknown armor and weapons. (1 Samuel 17:39) He chose the familiar. He had used a sling and a stone before. He had confidence in his ability because he put the time into learning and practicing. He also knew God so intimately that he knew He would equip him to fight Goliath. We need to prepare, putting our armor on daily to be ready for the trials. Not living in fear but with confidence that you have the Greater One living on the inside of you (Ephesians 6:10-17). Take this week to read 1 Samuel 17 and the related verses several times. Read in different translations (NLT, NKJV, Amplified, ESV, Message…) Devotionals can be easy to read and dismiss. We emotionally attach to the personal story in a devotional and often relate. However, like the parable Jesus told in Matthew 13/Luke 8– we have to prepare our hearts and minds to be good soil in order to absorb and allow His Word to take root. Only then can we truly experience the fullness life lived in Him. When trials come we will be ready to choose confident trust. How do you respond to fear? What practical ways can you prepare your heart and mind to retain God’s promises? Why do you think God used a shepherd boy to bring down Goliath instead of Israel’s army? Do you feel empowered, encouraged or equipped by David’s story? Why or why not? What specifically did he do? How can you learn from David’s example in your own life? Speak your trust. Speak truth. Speak faith. Say it out loud several times, until you believe it. Dear Heavenly Father, thank you for using David, a young shepherd boy, to defeat a mighty enemy. Thank you for giving me examples of how you use ordinary people to do big and mighty things. Please ignite my confidence in You and turn my tiny pebble of faith into a mighty missile. Holy Spirit, remind me of your promises when trials come my way. My heart is good soil and when I hear Your Word I understand and retain it. Let your truth bubble up into my heart and mind when trials come. Thank you for Your grace and love that equip, empower and encourage me. I love you Jesus. Share what God is revealing to you with someone— anyone. Sharing our faith with others is what builds our faith even more. We all have dreams. We each have a purpose for being on this earth. Sometimes in the season we find ourselves in (motherhood, tragedy, transition…) we have a difficult time focusing on Jesus to lead us toward that dream. I personally have had a difficult time trusting in His timing and being certain of what He placed in my heart. I have a passion for His Word and to encourage women how to live fully alive, love His Word and discover their own passions. I felt a nudge from Him a few years ago when I first started blogging. I began to blog about being a new mom and felt called to encourage other new moms. I had a rough experience with motherhood. My first daughter was extremely fussy, cried all the time and didn’t sleep well until about 6 months (sounds like most new parent experiences, doesn’t it?). I remember spending many late nights sobbing as I held my crying newborn. I felt alone and ill equipped for this extremely precious task of being a mom. In the midst of those terrible nights I felt God’s Presence. He spoke life into my situation and when I decided to listen and obey things started changing. This dream of encouraging new moms has morphed into a desire to teach women and encourage them in any season of life. God’s Word is alive and power for everyone at anytime. David understood this truth. In 1 Samuel 17 we see David going from the pasture to the battlefield. He was already anointed King of Israel but he wasn’t going from his pasture to the palace— just yet. Sometimes the step out of our comfort zone doesn’t look like the straight road to our dream destination. We may have to face some giants along the way in preparation for God to equip and train us for our calling. David went to the battlefield not the palace– but that was just the beginning. He was obedient. He trusted God’s plan, timing and strength. If God has placed a desire in your heart to pursue something that may be out of your comfort zone check in with His Holy Spirit. His Spirit bears witness with our spirit (Romans 8:16). You will, also, have a conviction in your own spirit and a peace. Your heart may be racing and you may be sweating but there will be an inner peace that comforts you– that’s the Holy Spirit (John 14:26,27). It’s easy to put ourselves down by looking at others who are doing what we want to be doing. “Well, they are already doing it, why does God need me to do it too?” “They do it so well, I could never be like her, doing what she’s doing.” —- You are right. You can’t do what she’s doing. You can’t be who she is. God called YOU specifically, uniquely. No one else can fill your shoes or take you place. Just ask your children or husband or parents. You are irreplaceable. Just because the calling or dream God placed in your heart doesn’t look like someone else’s, doesn’t mean it’s not right. God gives different gifts to each person (1 Corinthians 12:12-31). When we know God intimately, like David did, our hearts are changed to match God’s heart. Our dreams change to align with God’s dreams for us. Dreams that greatly exceed our expectations. Let’s look at the story of the boy who gave his lunch so Jesus could serve 5,000 hungry people in Mark 6. The little boy didn’t have enough to give everyone, yet He trusted Jesus with what he had. He gave of himself and Jesus was able to bless 5,000+ people with a young child’s small lunch. God can use you just the same. The decision you need to make is to give Him what you have. Trust Him to make your dreams come true. Trust Him to take you to the next level, but first you must be willing to take a step out in faith. Mark 11:24 tells us that we must first believe then we will receive. First, you need faith, then God will be able to blow your socks off with favor, blessings, peace, grace, power and more! He is faithful and His plans are far better than we could ever imagine. He’s just waiting for us to surrender all to Him. The right heart will produce the right outcome, even if it doesn’t turn out how we imagined (Psalm 37:23). David sought after God with a fierce passion. Jesus followed after God with complete obedience. What do you have? What can you give to serve the Kingdom of God? How do you find Joy in Jesus? Describe ways in which you get to know Jesus. Have you asked God for a dream? Has He shown you, but you feel nervous? Maybe it’s not the season… What could you do now to take that first step out? Do you struggle to believe first? If so, why do you think this is so? God’s looking for availability and willingness not qualifications. He just wants your heart above all else. Lets memorize and mediate on this truth. Heavenly Father I come to you in the Name of Jesus. Thank you for loving me so much. My hearts desire is to know you, really know YOU. I long to be in Your Presence and be filled, overflowing with Your Spirit. Only You know what the future holds. I commit all I do to glorify and honor You. I surrender to Your ways. I am choosing this day to take a step out in faith, believing that I will step into the calling You’ve placed inside of me. I love you Jesus, with my whole heart. I’m all Yours, Your all mine. Author Ashley KelleyPosted on February 7, 2017 November 21, 2017 Categories DevotionalsLeave a comment on What Do You Have? No one wants to go though life alone. A friend is one who is there in times of sadness and joy. Jesus says that He is a friend that sticks closer than a brother. He’s our best friend. He’s the one we need to seek first when times are hard and give Him thanks before sharing good news. He’s our everything and when we realize this truth we can live a life of freedom– fully alive. Although Jesus is our BFF, He stills wants us to do life together and be surrounded with God-fearing women; friends that will encourage, motivate, listen and turn our focus back toward Jesus. I have had struggles in the past with making and keeping friends. High school was especially hard for me. Those are years I do not want to revisit and for good reason. I didn’t make good choices that aligned with my faith and I had my heart broken one to many times by friends I thought were in it for the long haul. With those struggles I found solace in my relationship with Jesus and realized He wouldn’t leave me or forget about me. He wouldn’t toss me to the side for better friends. He wouldn’t stop talking to me because I made a mistake. He truly is in it for the long haul— thick or thin– better or worse. I remember praying for a godly girlfriend, a friend that would encourage me and be someone I could share a mutual passion for God. He has answered my prayers in more ways than I can count. I have a circle of girlfriends that have become my unshakable community. These are ladies I can share my heart, my fears, ambitions, desires, struggles and more; knowing they will encourage me, pray for and with me, and turn my focus toward Jesus. Friendship is one of the best gifts God created. We were never meant to live life alone. The Bible is full of friendships that give us godly examples of how two are better than one. Paul and Barnabas went all over Galatia preaching the gospel and bringing people to Jesus. While in Lystra, Galatia Paul was beaten and dragged outside the city. Barnabas along with other believers surrounded Paul and prayed for him. Afterwards Paul got up and went back into the city. God uses friends to pray for us in times we can’t carry the burden alone. We need to be surrounded by praying women. During the battle against the Amalekites, Aaron and Hur held up Moses’ arms during the battle because every time Moses lowered his arms, holding the staff, the Israelites would start to lose. God uses friends to hold us up when we are too weak to carry on. David, the warrior king, needed encouragement from Jonathon when all hope seemed lost. God uses our friends to point us back to Him and His word. Our minds, the world and our feelings often have too much input into our lives. God’s Word is most important and truest truth. If Jesus needs friends… we ALL need friends. He poured His heart out about His impended death to Peter, James and John right before He was arrested and crucified. God uses our friends to help shoulder the hardships and trials by sitting with us, listening and praying with us. Naomi thought her life was over. He husband and sons were all dead. Yet, Ruth stood by her side and gave her a new life to enjoy with a grandson that would be a descendant of Jesus. God uses friends to add joy to our lives and bring us happiness. While in Philippi, Paul and Silas were beaten, flogged, stripped and imprisoned together. They also witnessed a miracle when God opened the jail doors and the jailer was saved. God uses friends to stand with us through trials and be there when we come out. It’s better to endure together and have a victory to praise God for when you reach the other side. God uses friends to mutually encourage one another. Take some time to thank God for the friends you have in your life and ask God to surround you with friends who love Him and seek Him first. God wants us to be in community and live life to the fullest — together. If you’re not in a small group community at your local church I would encourage you to join if available. If not, maybe you could start one. God will meet all your needs according to His riches and glory. He won’t leave you without friends; allow yourself to be sensitive to His leading and step out in faith. Friendships take time to grow and strengthen. Don’t be discouraged if your first try doesn’t succeed. Have faith and know Jesus is your FIRST Best Friend– always available. How does the Word describe friendship? Do you consider yourself to be the type of friend God’s Word describes? Describe another friendship found in the Bible. Describe how God uses friends to build His Kingdom. With God in the center nothing is impossible. Heavenly Father I come to you in the Name of Jesus. Thank you for surrounding me with friends who love You. It’s my hearts desire to be a good, loving friend. Help me to be the kind of friend you’ve called me to be. Ultimately, You are my first and best Friend. I love You and want to know You more. Today we are going to study our power of influence as women. The sense of smell triggers emotion and memory. I can remember the smell of my mom when I was growing up. I can’t recall the name of the perfume she wore, but she had a sweet, comforting fragrance that made me feel safe and loved. On nights when my brother and I would stay at my grandmas while my parents went out to dinner I would get so excited for her to return just to smell her. It was H.O.M.E. to me. She was my world and I adored her– still do. My mother had an enormous influence over me. She was my first teacher and guide. She nurtured me, helped me grow and develop, taught me right from wrong and encouraged me in the right direction. As women, we have this amazing, powerful and frightening gift of influence over our children and families. We have to choose to use that power for good and not evil. There’s a fine line between influence and manipulation. We want to raise godly children not brainwashed children. We want honest and loving marriages not stepford husbands. Eve was the woman behind the fall of man. Satan knew of Eve’s influence and tricked Adam by persuading Eve first. Adam was influenced by Eve to eat the fruit of the forbidden tree. Just as Eve was targeted by Satan in the garden of Eden we can become targets if we aren’t Prepared, Patient and Poised. _______, and his heart was not ________ _________ to God (1 Kings 11:4 NIV). The wisest king in the entire earth still fell pray to the influence of women. What a gift was possess. I believe God has called us daughters to action and intentional living in order to be gentle and peaceful instead of anxious or stressed. Patience: (this is my area of internal struggle— I always want to do things on my time instead of waiting for the right time.) Seek God’s purpose and plans for your life. Let him tell you “when”. Be patient as you wait in His Presence. Poised: Well-Mannered, Balanced, Nobel Character: We are dispensers of God’s grace. He uses us, ladies, to nurture, encourage, love, teach and so much more. When we find our confidence in God’s competence we are able to live balanced, composed and courageous lives. In closing, let’s take a look at the influence of Queen Esther and the way she prepared, was patient and poised. From the moment she entered the palace she found favor with the king and all those in authority. She was given special food and beauty treatments immediately. Having favor allowed Esther to gain confidence that allowed her to be used by God in a mighty way. Finding favor gives you influence. How do you receive favor from people? How do you influence people the most? What about Esther’s story of influence seems most remarkable? When you think of influence, what/who do you think about? Why? Do you influence or manipulate more? Take a moment and list your strengths. We have a choice to use our influence for encouragement or discouragement. Choose to speak life today. Heavenly Father I come to you in the Name of Jesus. Thank you so much for loving me. Lord, influence my personality, alter me from the inside out to reflect Your glory. You are my rock and foundation. I will choose to be an influence for good. All I do I do for You, to honor and glory Your name. Help me to encourage and uplift, be patient and poised and prepared for all that comes my way. Download this iPhone 6 wallpaper as a daily reminder this week. Have you ever felt like you’ve missed the mark one too many times or missed the path that God has laid out for you to take? I know I have. I question my decisions all the time and wonder if I made the wrong choice or missed an opportunity God set up for me. I find myself wondering how God can use me when I keep messing up. How can I be in His perfect will if I cannot figure out what it is? Well, Jeremiah had some words of wisdom for me today. In Jeremiah 18:4, he describes a scene that he witnessed in which a potter is shaping and creating a pot. But, the pot he is making is marred (damaged, flawed, spoiled, blemished). Instead of throwing it out and getting a new piece of unmarred clay, the potter takes the same piece and begins to rework, reshape, and recreate another pot… one that is the best. I am that marred clay; blemished, flawed, and spoiled because I’m human. But, God doesn’t throw me out and get someone different to fulfill the plans He has for me. He takes the same ole’ me. I don’t know about you, but that’s a huge relief. Phew. Even in my “marred” state, God sees my potential and He sees the “pot” I can be. He continues to use me. So, when I wonder if I’ve missed hearing His voice, missed an opportunity to witness to someone, missed the path He laid out for me… He doesn’t give up on me. He never leaves me behind, He’s always walking along this journey with me. I hope this helps someone today that way it helped me. He’ll never give up on you. Let Him reshape, rework, recreate you into the person He’s called you to be. He loves you so much and just wants the very best for you. Have you ever found yourself doubting what you always thought was true? Have you ever questioned your faith? I have. I heard it once said to “lead through your weaknesses” so that your humanity will show. My weakness is my mind and the thoughts that I let invade. God’s been teaching me through His word about doubt and faith. I grew up going to church, became a Christian at the age of four, attended a Christian school, had a pastor for a dad, a missionary for a grandmother…etc (you get the picture). I was imbedded in my faith. I loved that about my childhood. But, as an adult I’ve found my own relationship with Jesus outside of my family and “upbringing”. I had to discover Him for myself. I did. However, over the course of my adulthood, I’ve had bouts of doubt. Doubt in everything. I would let my mind run away with thoughts about my purpose on the earth and the reality of Jesus. While worshipping and praising Him with song at the begging of a church service my thoughts would shift from Jesus’ face to “wow, I look to ridiculous, raising my hands to an invisible ‘God’.” At that moment, I would stop and repent. Making know to God my doubt, my hesitation, my weaknesses. The funny thing is, no one would’ve ever known this about me. I never talked about it with anyone, never let it show in my actions, never spoke it out loud in a private prayer. It was a hidden hiccup, a hidden doubt. I felt so ashamed. How could I doubt Jesus and His love for me. Then I’m reminded of doubting Thomas in the Bible. Thomas was a disciple who couldn’t just believe that Jesus had risen from the grave, he had to see it for himself. But, that’s not faith. Faith is being sure of what we hope for and certain of what we do not see. Hebrews 11:1I was letting my focus slip away from Jesus and drift towards doubt. I needed a serious intervention from God. So, I dove into His word. I will be talking more about doubt in upcoming posts. God’s working this out through me and by His grace I’m conquering doubt by building my faith. 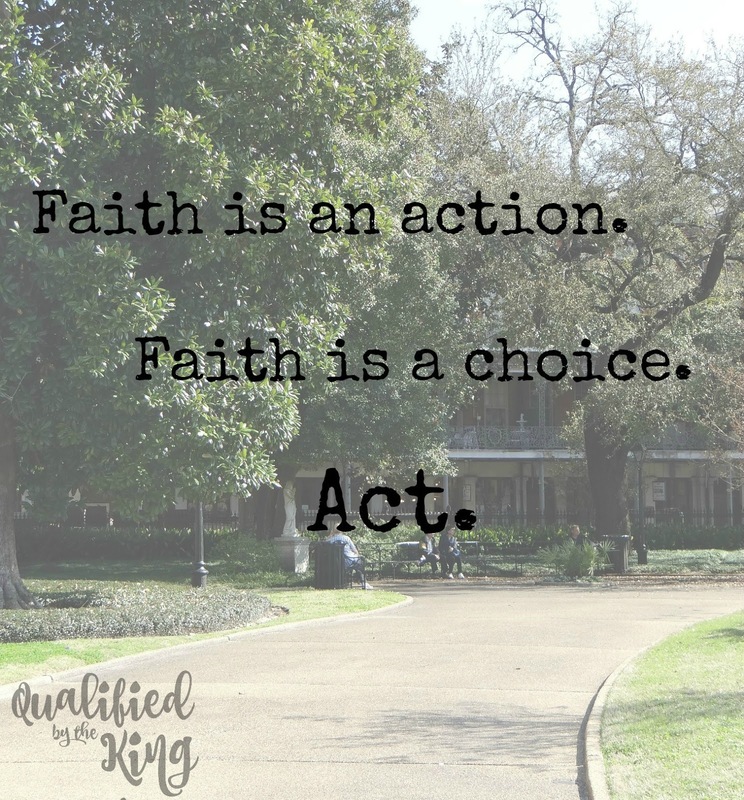 Faith is an action. Faith is a choice. Act. I choose to believe in Jesus. I choose to trust in Him. I’m dropping my doubt and picking up my Bible. I’m acting to believe. Read more about how to lead through your weaknesses here.